Scientists Warn World Facing Major Famine, Could "Lead To Severe Shocks To Global Food System"
Researchers from Washington State University have published a new report of the Great Drought, the most destructive known drought of the past 800 years - and how it sparked the Global Famine that claimed the lives of 50 million people. The scientists warn that the Earth's current warming climate could spark a similar drought, but even worse. One of the lead researchers, Deepti Singh, a professor in WSU's School of the Environment, used rainfall records and climate reconstruction models to characterize the environmental conditions leading up to the Great Drought, a period in the mid-1870s known for widespread crop failures across Asia, Brazil, and Africa. 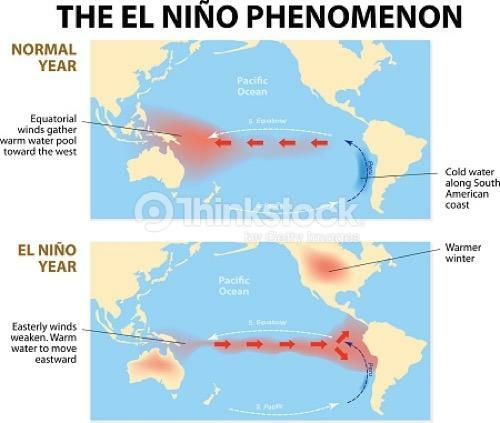 The drought was connected to the most extreme manifestation of the El Nino supercycle ever recorded. "Climate conditions that caused the Great Drought and Global Famine arose from natural variability. And their recurrence -- with hydrological impacts intensified by global warming -- could again potentially undermine global food safety," lead author Singh and her colleagues wrote in the Journal of Climate, published online Oct. 04. The release of the study came days before the UN Intergovernmental Panel on Climate Change (IPCC) warned that global warming could cause intense droughts, floods, extreme heat and poverty for hundreds of millions of people. WSU says Global Famine was among the worst humanitarian disasters in modern time, comparable to the influenza epidemic of 1918-1919, World War I and World War II. As an environmental disaster, it was the worst. "In a very real sense, the El Nino and climate events of 1876-78 helped create the global inequalities that would later be characterized as 'first' and 'third worlds'," writes Singh, who was influenced by "Late Victorian Holocausts: El Nino Famines and the Making of the Third World," which detailed the social impact of the Great Drought and additional droughts in 1896-1897 and 1899-1902. Singh's report is the first global-scale analysis of climatic conditions for the 1870s. There are no other in-depth studies that characterize the dynamics of what led up to the Great Drought. "This is the first time that somebody is taking multiple sources of data -- like rain gauges and tree-ring drought atlases that let us go back 500 and 800 years (respectively) -- as well as multiple datasets of past climatic conditions, to quantify the severity of this event and the severity of the conditions that led to it," Singh said. 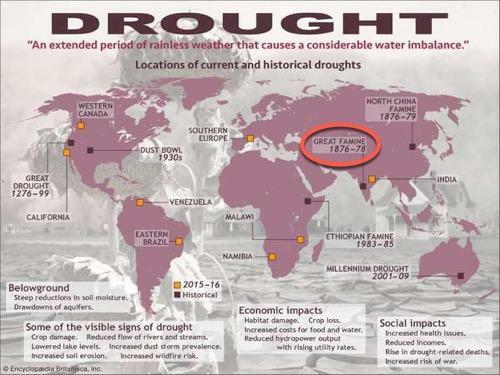 "The length and severity of the droughts promoted the Global Famine, aided in no small part by one of the strongest known El Ninos, the irregular but recurring periods of warm water in the tropical Pacific Ocean. That triggered the warmest known temperatures in the North Atlantic Ocean and the strongest known Indian Ocean dipole -- an extreme temp difference between warm waters in the west and cool waters in the east. These, in turn, triggered one of the worst droughts across Brazil and Australia," said WSU. Singh said natural variations in sea-surface temps induced the drought, a similar weather event could occur today, but a lot worse. With rising greenhouse gases and global warming, the researcher said El Nino events could become intensified in the future, in which case, "such widespread droughts could become even more severe." Singh warns that "such extreme events would still lead to severe shocks to the global food system with local food insecurity in vulnerable countries potentially amplified by today's highly connected global food network." While the WSU scientists, UN, and IPCC warn of impending climate danger, President Trump on Sunday told CBS' 60 Minutes in an interview that climate change scientists have a "political agenda" as he casts doubt on whether humans were responsible for Earth's rising temps. Trump suggested that climate change might not be caused by humans, and added that he did not want to take action that could cripple the American economy. "I think something's happening. Something's changing and it'll change back again," said Trump. "I don't think it's a hoax. I think there's probably a difference. But I don't know that it's manmade. I will say this: I don't want to give trillions and trillions of dollars. I don't want to lose millions and millions of jobs." While WSU scientists, IPCC, and now President Trump have all stated that global temperatures are, in fact, rising, it seems that all parties are at disagreement to what is actually causing the anomaly. One thing, however, is likely: a sharp increase in temperatures, for whatever reason, could trigger the next big El Nino supercycle that would devastate global food supply chains and trigger another famine, a contingency for which the world is not prepared.